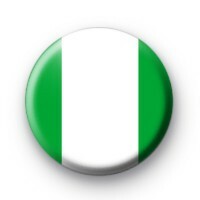 Nigerian flag badges in green and white stripes inspired by the African state of Nigeria & it's wonderful people. Our world flag badges are always popular and we are always adding to our range. We have various African flag badges along with flags from around the world, not to mention UN flags and EU flags, so be sure to have a browse through our range. If you find any flag badges are missing from the website, get in touch & we will happily add them to our range. Our flag badges are always really popular & we have customers around the world. We offer worldwide delivery on all orders & delivery is free on larger orders. We also have a next day delivery service which is available during checkout if you need your badges in a hurry. Standard 25mm button badge made by hand in our family run workshop.